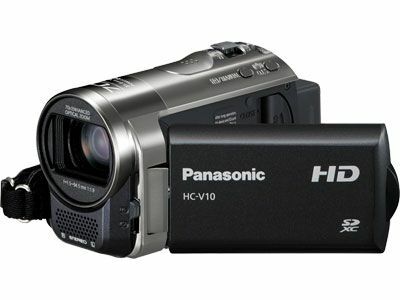 The Panasonic HC-V10 is a high definition camcorder that records 1280 x 720p video in the MPEG-4/H.264 format. When the HC-V10 first hit shelves, it carried a suggested retail price of $249. This camcorder has since been discontinued, but now it can still be found used from some online retailers. The HC-V10 It is a close cousin of the Panasonic HC-V100. Full technical specifications for the HC-V10 can be found on the Panasonic website. The HC-V10 uses the MPEG-4 format for 1280 x 720p high definition recording. It supports 15Mbps recording. You can also drop the resolution to 840 x 480 resolution, 640 x 480 or iFrame recording (at 960 x 540) for movies that can be easily edited on most computers. The HC-V10 features a 1.5-megapixel 1/5.8-inch CMOS image sensor. The camcorder uses Panasonic's "Intelligent Auto" mode for automatically matching scene modes such as portrait, sunset, scenery, forest and macro mode, to shooting environments. The model employs various technologies - including image stabilization, face detection, an intelligent scene-selector, and contrast control to optimize your exposure. You'll find a 63x optical zoom lens on the VC10. This optical zoom is joined by a 70x "enhanced optical zoom," which can enhance the magnification of your footage by using a smaller portion of the sensor without losing image resolution. Finally, there's a 3500x digital zoom which will degrade resolution when in use. The lens employs Panasonic's Power Optical Image Stabilization (O.I.S.) for keeping your footage relatively shake-free. The image stabilization technology has an active mode which can be enabled when walking or when you're otherwise in an unstable position to provide extra shake reduction. A manual lens cover protects the V10 lens. It's not as convenient as the automatic covers found on higher-end Panasonic models. The V10 records directly to an SDHX memory card slot. There is no relay recording. The HC-V10 offers a 2.7-inch LCD. There is no optical or electronic viewfinder. Design-wise, the HC-V10 cuts a fairly conventional, if somewhat boxy, figure. Thanks to the use of flash memory you'll still enjoy a lightweight body at 0.47 pounds. The HC-V10 measures in at 2.1 x 2.5 x 4.3 inches, roughly the same form factor as the entry-level series of Panasonic camcorders, and features a zoom lever on the top of the camcorder and a record shutter located on the side, next to the camcorder's battery. Open the display, and you'll find buttons video playback, scrolling, and info, plus the camcorder's ports: component, HDMI, USB and AV. The HC-V10 is available in black, silver and red. The HC-V10 is outfitted with a fairly minimalistic feature set, which is not surprising given its price. It offers face detection a pre-record function which records three seconds worth of video before you hit the shutter. The V10 also offers an auto ground-directional standby mode, which detects if the camcorder is being held in an unusual position (say, upside down) and automatically stops recording. A low light/color night recording mode preserves colors even in dim lighting. As far as scene modes go, you'll find sports, portrait, low light, spotlight, snow, beach, sunset, fireworks, night scenery, night portrait, and soft skin mode. You can snap .9-megapixel photos while recording video on the V10 (not a great resolution). Still, photos can also be isolated from video footage played back on the camcorder and saved as a separate file. There is a two channel stereo microphone. The HC-V10 offers a built-in HDMI output for connecting the camera although the cable is not included. You can also connect to a PC via USB cable. The HC-V10 compensates for the lower resolution specification with a super high-powered lens. If sharper video quality is more important to you than a long zoom, consider Panasonic's slightly more expensive V100 which is the company's least expensive model to feature 1920 x 1080 recording. It does, however, have a lower zoom lens at 32x.